During feeding therapy today, Braska decided to try a few new things, and show off a few others. She ended up taking almost 7 oz total (finishing 1 partial jar, downing a whole one, and starting a 3rd), which is a record, for sure. She showed off for Miss Louis with some raspberries, mouth full of food, of course, and with some very passionate short bursts of some apparently important information that we couldn't quite decipher. Here's some visual evidence of the other recent mealtime fun. A common theme during feeding therapy sessions has been Louise telling me that I have to let Braska make a mess, which I'm not good at doing. 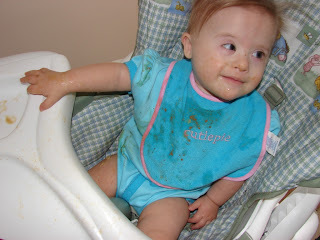 I tend to want to keep hands clean and all mess on the bib only. Today, I succeeded in letting her go at it. And we ended up covered in mush...both of us. Oh boy - it's so pretty on your blog! WTG Braska - keep up the fantastic eating work!! Love the photos, love the new look, love the sweet baby!!! Where did you have the photos done? Great eating Braska!! I am going to send Gracie over for some lessons. And then she can teach you how to make a really big mess!! I like the way you eat. You make it look like you get a nice long hot bath afterwards. Good job. Thanks for your comments! I love the feedback! I'm a wife, mother, sister, daughter, and friend; just trying to do the best I can at each of those positions.